The Sony Xperia Sola has been designed on Android platform and has been loaded with some of the most sought after features for an enhanced user experience. This mobile phone promises an optimised performance with Android v2.3 (Gingerbread) operating system running on a dual core processor that has a clock speed of 1 GHz. In addition to this, the Xperia Sola has been embedded with 512 MB of RAM to efficiently handle multi-tasking. This Sony phone comes loaded with a 3.7 inch TFT capacitive touchscreen that supports a resolution of 854 x 480 pixels for clear and crisp picture quality. Also, Sony has introduced the floating screen feature with this phone to help you highlight an icon on the screen by moving your finger over it before you tap on it to open. This feature is meant to avoid accidental touch on other icons. This floating screen, in addition to the Timescape user interface, promises a dynamic user experience. The Xperia Sola has incorporated Mobile Bravia Engine technology for color management, noise reduction, and sharpness filtering apart from contrast management to reproduce life-like graphics and images. Also, the Sola comes with a scratch-resistant screen. This Sony Xperia sports a 5 megapixel camera on its back to help you capture and store live action in vibrant stills. However, its ability to record videos with 1280 x 720 pixels of resolution and that too at 30 frames per second, empowers you to capture your surroundings in moving stills. Additionally, the LED flash present with the camera helps you get clear visuals even in dim light. Some of the other noticeable features include HD recording, 3D sweep panorama, geo-tagging, touch focus and 16x of digital zoom. 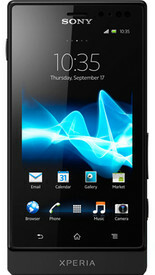 The Sony Xperia Sola gives you the feel of a well-built device with its candy bar shape and plastic body. The back side of the phone has got a soft touch rubber finish for comfortable handling. Also, it houses the camera along with the flash. On the right side of the device, you will find the lock-key and volume rocker. With this phone, you don’t need to look for the camera option in the menu bar as the 2 stage button provides you direct access to it. Sony has embedded this phone with accelerometer, proximity sensor, compass and light sensor. The Xperia Sola is powered by a 1320 mAh battery that promises to deliver a talk time of up to 6 hours and a standby time of up to 475 hours. To meet all your storage related requirements, this phone has incorporated 8 GB of internal memory that can be expanded up to 32 GB with a microSD card. The Sony Xperia Sola has on-boarded most of the communication features to deliver an optimised user experience. You can opt to connect with the world of Internet through GPRS and EDGE technologies that utilise 2G waves surrounding you. However, if fast internet browsing is your requirement then the 3G support in this phone will help you connect to the third generation network. The WiFi feature lets you benefit from the nearest WiFi hotspot to connect with the Internet.